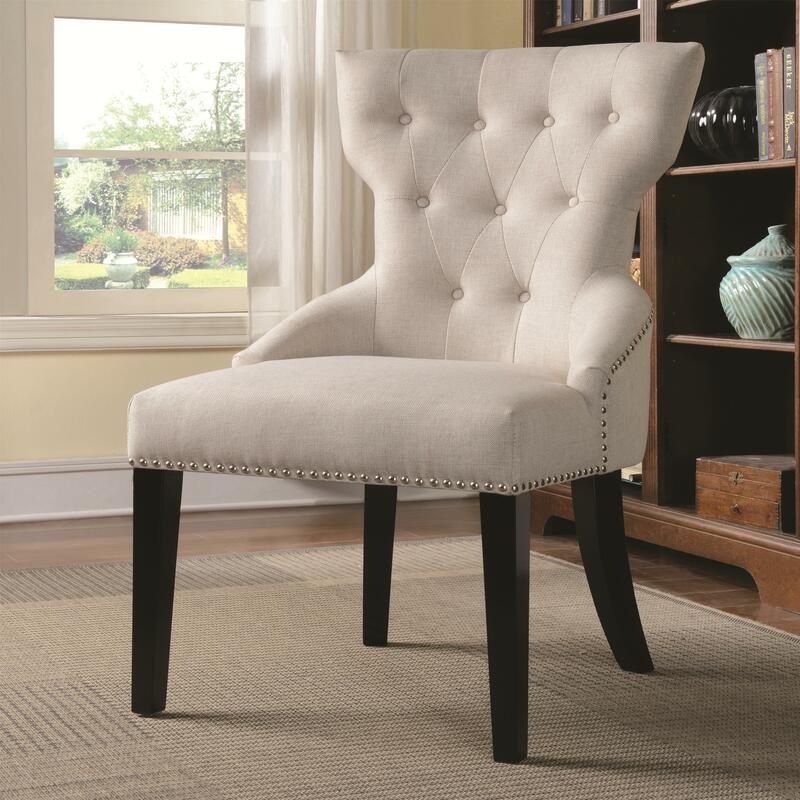 This transitional accent chair has an attractive silhouette that is elegant and fun. The seat cushion is made up of upholstery pulled tightly over cushioning for a seat that looks tidy with a firm sitting comfort. the Seat back has lightly tufted accents that keep the comfort level a little bit softer. Details include buttons adorning the back tufts, nail head trim and straight legs finished in a rich, dark tone. The Accent Seating Button Tufted Back Chair with Nail Head Trim by Rooms Collection Two at Rooms Furniture in the Houston, Sugar Land, Katy, Missouri City, Texas area. Product availability may vary. Contact us for the most current availability on this product. Seat Back Tight seat back with light button tufts and a sophisticated silhouette. Seat Tightly upholstered seat cushion for a firm sitting experience and a tidy look. Leg or Skirt Traditional wooden legs in a simple, straight style with a slight slant.